My style of yoga is influenced by Quantum Yoga, Forrest Yoga, Ashtanga and Hatha Yoga incorporating elements of Kundalini Yoga and various other kriyas and pranayama/breathing exercises. My classes range from private tuition to large groups in beautiful studios and retreat locations around the world. My classes are from 90 minutes up to 3 hour workshops and week long retreats. In class I lead students through their practice whilst ensuring their correct position and alignment with gentle assists and adjustments. I am sensitive to each students individual needs, from the beginner to the experienced and I seek to ensure they get the maximum benefits out of each class. My practices commence with pranayama (breathing exercises) then move to increasingly dynamic asanas (postures) taking account of the level of each student. Through creative sequencing and attention to detail I encourage my students to move freely, deeply, and mindfully into their bodies. 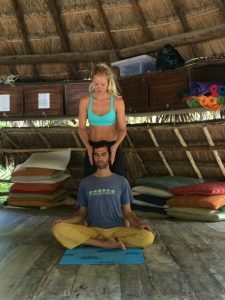 I take inspiration from Quantum and Forrest Yoga’s grouping and sequencing laws, and end with savasana and meditation where I use massage and the senses of smell and touch to bring you into a deeper space and sense of relaxation. I incorporate both the physical and spiritual aspects of yoga whilst allowing my students to develop their own understanding of yoga in an enjoyable way. As I take you through the asanas I talk about their origin in sanskrit. I want my students, particularly those new to yoga, to understand what they are doing beyond just the move itself and use different ways to describe the reason behind the pose and the benefits it can bring. My classes also adopt the holistic approach to health from the ancient Indian healing science of Ayurveda. I believe yoga can enable growing self-awareness, acceptance and compassion for living a full and spiritual life. With deep stretching and relaxation you can release tension, centre and ground yourself. To further the healing process; incorporating Ayurveda, the the science of life, in to your yoga practice, you will resonate with your personal requirements at all times and balance your inner nature, which ultimately will bring you into a state of greater harmony with the environment.